What does a creepy doll, a small town thrift store, and a missing woman have in common? When antique pickers Sherri Green and Carol O'Brien take a day trip to Broom Top to visit Maisy's Miracles, trouble brews. At Maisy's small thrift store jam packed with treasures they learn that Maisy Dupree, the shop owner, has been missing for two months. Sherri and Carol get busy trying to piece together what happened to the sweet elderly lady. They come across shady characters at every turn who may have harmed Maisy. And the doll from Maisy's shop that Carol loves (and Sherri hates) causes problems that surprises them both. Picked On is a cleanand wholesome short read. It’s perfect for lovers of cozy mysteries that feature an amateur sleuth. 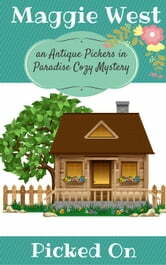 Be sure to check out book 1, Picked to Death; book 2, Cotton Picking Murder; and book 4, Pick a Letter, in the Antique Pickers in Paradise cozy mystery series for more small town fun and crime solving in the close-knit community of Paradise. I really enjoyed this book, it flowed along at a nice steady pace. Good work. Carol and Sherri are becomming very competant sluerhs and a a reader you can get some valuae picking tipsif you ead carefully.